On August 24, 2017, Ukrainian citizen Pavlo Hryb (age 19) went missing in the Republic of Belarus. As of September the 4th 2017 his whereabouts remain unknown. Belarus authorities confirmed the border crossing; however did not confirm his arrest or detention. Pavlo’s family, lawyer, Ukrainian human rights activists as well as The Security Service of Ukraine believe that Pavlo could have been subjected to enforced disappearance and transferred to Russian Federation by The Federal Security Service of Russian Federation. On August 24, 2017, Pavlo Hryb traveled to the city of Gomel in Belarus to meet a female with whom he became acquainted online and communicated through social networks, at first through VKontakte, and then via Skype. He had not previously met her in person. It is understood the female was coming for the meeting from the Russian Federation. Pavlo’s parents were advised by him that he was going to come back home at the same day. The next day when Pavlo had not returned, his father Ihor Hryb travelled to Gomel in Belarus to look for him. In the course of this trip, Ihor Hryb was informed that his son was wanted for violating Article 205 of the Criminal Code of the Russian Federation (terrorist act) and that this charge was filed by the Federal Security Service (FSB) of the Russian Federation in Sochi, Krasnodar Krai. According to information of Ukrainian media, the female from Sochi whom Pavlo Hryb went to meet had been directed to set up the meeting in Gomel under duress from representatives of the Russian FSB after they opened a terrorist case against her and then threatened her. Pavlo Hryb has never visited the territory of the Russian Federation before, and has only been abroad outside Ukraine once in 2012 as a child. After the commencement of Russian military and political action against Ukraine in 2014, Pavlo Hryb was actively writing in social media, using strong language against those he perceived as war criminals. Taking into account the strengthening of control by Russian law enforcement over the Internet, we assume that Pavlo’s activism in social media could drew the attention of FSB. 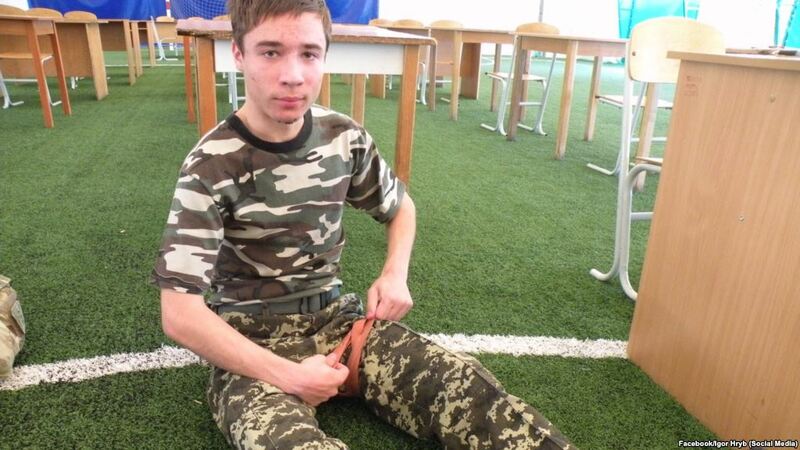 Pavlo Hryb had not taken part in combat operations in the East of Ukraine, and has not served in military agencies. He was prevented from doing so on the basis of his state of health, which renders him legally disabled and requires ongoing treatment. In response to the parents’ requests for information, the Belarus Gomel border unit declined to provide any clarification, citing an absence of information. This is despite the fact that border forces are under instruction to detect at the checkpoint persons subject to a ‘wanted notice’, and to detain such persons and convoy them to the relevant agency. It is known that common databases are used for such purposes by the authorities of Belarus and Russia. The Consul of Ukraine in Minsk reports that according to official information, Pavlo Hryb is not among those detained in pretrial detention centres of Belarus. The Embassy of Ukraine in Belarus has sent a note to the Belarus Foreign Ministry inquiring about the whereabouts of Pavlo Hryb. Acknowledgment of this communication by the Foreign Ministry of Belarus has not been provided. In respect to the above circumstances, the prosecutor’s office in Chernihiv, Ukraine has instigated a criminal investigation concerning the disappearance of the Ukrainian citizen in Belarus. The known facts point towards a significant likelihood of enforced disappearance of the Ukrainian citizen Pavlo Hryb in which the FSB of the Russian Federation are involved, luring Pavlo out to Gomel in Belarus under the guise of meeting a female. To provide Pavlo with an urgent access to proper and quality medical care and treatment, Ukrainian Сonsul and independent lawyer. To ensure the proper investigation of the enforced disappearance of Pavlo Gryb. Fully cooperate with Ukrainian authorities in investigation of the enforced disappearance of Pavlo Gryb, provide Ukrainian General prosecutor’s Office with the information, videos, names and testimonies of the border guard service representative and other materials, as well as the procedure of the interaction of the border guard service and the FSB in the cases of persons in search of the FSB. To use all the instruments of the international cooperation between Ukraine and Belarus to request the information on the circumstances of disappearance of Pavlo Gryb. To demand from Russian Federation to provide a meeting with Ukrainian Consul and/or Ukrainian Ombudsman. We urge the international community, UN, OSCE, European Union, US – to demand from Russian Federation to provide Gryb family, their lawyer Ukrainian state with an comprehensive information on the place of detention of Pavlo Gryb, charges against him, his health, to provide an access to proper medical treatment, Ukrainian Consul and independent lawyer.